This production of Paula Vogel's play, which uses shifting between gears as a metaphor, is stuck in neutral. As directed by Elizabeth Schwan-Rosenwald, 20% Theatre Company Chicago's staging of a potentially intense story is too even in its pacing and performances to have much impact. The play revolves around a young woman, Li'l Bit, who was sexually abused by the uncle who taught her to drive. Jessica Hutchinson is confidently coy as the adult Li'l Bit recounting her tale but unconvincing as the confused, awkward girl made uncomfortable by her uncle's attentions. 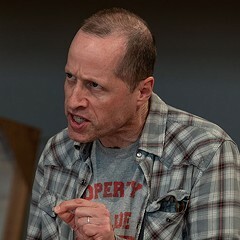 Dan Stearns also idles in the role of Uncle Peck, his bland affability effectively obscuring the character's struggle and the strength of his feelings. Only the versatile, energetic Lisa May Simpson as both Li'l Bit's mother and Uncle Peck's wife is able to rev up at least a few of the show's scenes. Through 7/1: Thu-Sat 8 PM, Sun 2 PM. Wed 6/29, 8 PM. Profiles Theatre, 4147 N. Broadway, 773-944-0039. $15. Paula Vogel's play is a stunner, but this production hits a few wrong notes.